"Michel Odent asks the fundamental question that is often avoided: What is health? If you don't find it easy to come up with an answer - and especially if you do - read this book. It is brilliant!" - Sheila Kitzinger, author of Rediscovering Birth and Birth Your Way. "A revolutionary new book ... that challenges all our assumptions about health." - Vogue. "Fascinating and complex theories for everyone interested in delving deeply into the complex concept of health." - Here's Health. 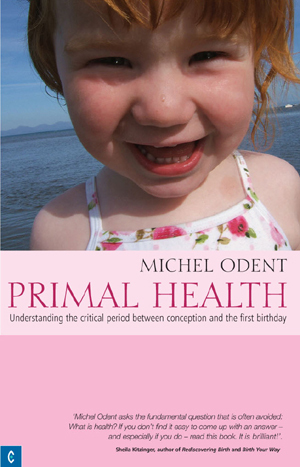 Michel Odent, the leading pioneer for natural childbirth, indicates that the period between conception and a child's first birthday is critical to life-long health. In this prophetic book - first published in 1986 and reproduced here in its original form - he argues that different parts of the 'primal adaptive system' develop, regulate and adjust themselves during foetal life and the time around birth and infancy. 'Everything which happens during this period of dependence on the mother has an influence on this basic state of health, this primal health.' He suggests that the later well-being of adults, their ability to withstand the 'diseases of civilization' such as hypertension, cancer, alcoholism and failures of the immune system resulting in AIDS, allergies and viral diseases, can all be traced back to society's ignorance of the vital importance of the primal period. Since the first edition of this groundbreaking work, research has continued apace, offering further evidence to substantiate Odent's ideas. In the important new Introduction and Postscript, the author reviews recent developments and relates them to the central themes of Primal Health. This book is essential reading for all who care about the health of our children and the ongoing health of society as a whole. MICHEL ODENT, born in 1930, qualified as a general surgeon. He is popularly known as the obstetrician who introduced the concepts of birthing pools and homelike birthing rooms at the maternity unit in Pithiviers (France) in the 1960s and '70s. His ongoing influential work in childbirth and health research has featured in TV documentaries such as the BBC's 'Birth Reborn', and in authoritative medical journals. More recently, he has founded the Primal Health Research Centre in London and has developed a preconceptional programme to minimize the effects of intrauterine and milk pollution. He is currently researching the non-specific, long term effects of early multiple vaccinations. Michel Odent is the author of dozens of scientific papers and 10 books published in 20 languages.